Fifteen carries, seven catches, 88 offensive snaps, one punt return for 10 yards. That was all Darren Sproles was able to contribute to the Eagles' Super Bowl-winning season before suffering a torn ACL in his left knee, a broken radius bone in his right forearm and wrist ligament damage, when Sproles was upended by New York Giants safety Darian Thompson early in the second quarter of the Eagles' victory on Sept. 24. Fans remember that afternoon for Jake Elliott's 61-yard walk-off field goal, but Sproles remembers it as the day his career almost ended, far too abruptly. He'd said before the season began that 2017, his 13th NFL season, would be his last. But he wasn't thinking of his career ending in September. "The way I went out last year, if I'd retired after that, I might think later on, down the line, it wouldn't be right for me," Sproles said Tuesday, following a minicamp session that was his first visit to the NovaCare practice field wearing a helmet and his familiar No. 43 jersey in nine months. "It felt great to be back. The knee is doing great," said Sproles, who turns 35 on June 20. He didn't really do a lot Tuesday, and Eagles coach Doug Pederson prefaced an answer about Sproles' role this season by saying "primarily, we have to make sure he's 100 percent." But Sproles said he'll definitely be able to practice without restrictions six weeks from now, when training camp starts. "If they let me go full-go right now, I could," he said. "They're holding me back a little bit … I feel 100 percent." It has been quite a journey back to that spot. Despite taking more than a few hits over the years, at 5-6, 190, Sproles had never played in fewer than 15 games in a season before 2017. It was a complex, devastating injury, and his age made the outlook for full recovery tricky. The early days of wearing a sling and a knee brace were difficult. "Once I got my mind set on it, I could start rolling. My main thing was, once I got walking, and once I started jogging, I was fine. … That's kind of when I got my head back right," Sproles said. Like 36-year-old left tackle Jason Peters, who also is coming back from a season-ending injury, Sproles is an anomaly. Of the running backs drafted into the NFL in 2005, only Frank Gore, taken 65th overall, in the third round, and Sproles (130th , in the fourth) remain active. Sproles was the eighth back selected that year. The seventh, Brandon Jacobs, last played in the NFL in 2013, the year before Sproles began his Eagles career. Darren Sproles, who suffered a season-ending injury on this play last September, is returning to the field slowly. Watching the Eagles win the Super Bowl without him "was the toughest time ever," Sproles said. "That's why I worked so hard to get back. So I could make another run at it." Sproles did his surgery and rehab in California, but he texted or called the Eagles' running backs early in the week after each game, offering his insights from watching film. 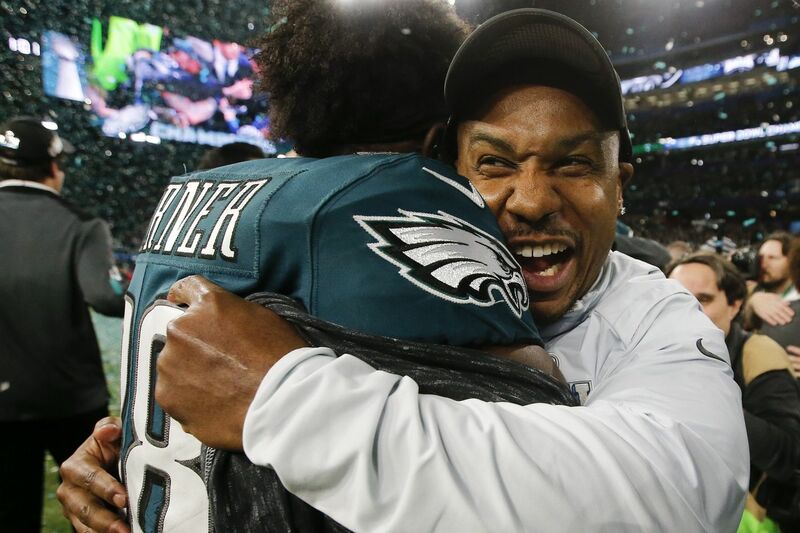 "He's always saying, 'Keep your eyes on your read,' " said Corey Clement, the undrafted rookie who became a Super Bowl star at least in part because Sproles was on the sideline, instead of on the field. "He would see some of our eyes go off track, and that's why some of the runs weren't there, and he would say, 'Stay patient.' "
It was Sproles who had to marshal patience on Feb. 4, watching Clement catch four passes for 100 yards in the game that ended the Eagles' 57-year title drought. Clement's 22-yard touchdown catch at the back of the end zone gave the Eagles a 29-19 third-quarter edge. "We knew when we were practicing during the week it was going to be a touchdown," Sproles said. "He did a great job last year of doing all the third-down stuff, and stuff like that." Sproles' wife, Michel, posted on Instagram after the Super Bowl about how Sproles' injury opened the door for his friend Kenjon Barner, the ex-Eagle whom Sproles recommended to take his place. Barner, not offered a new contract by the Eagles in 2017, had been cut by the Chargers a few weeks before Sproles went down. Michel Sproles wrote that her husband had wondered about the purpose behind his injury, but after the Super Bowl, Darren "walked up to me and said, 'I know why God used me' … For this moment right now! Then he smiled and said, 'I'm proud of these guys, I'm proud of my brother!' Now we both [are] Blessed!" Darren Sproles agreed Tuesday that "the way things turned out, we all got what we wanted. It all worked out perfectly." But of course, as happy as Sproles was for Barner and for Clement, it didn't all work out perfectly. If it had, he wouldn't be sweating on a June practice field, trying to rev the engines for a 14th NFL season. Sproles ranks eighth in all-time in all-purpose yards, with 19,155, 25 behind Steve Smith Sr., 35 behind Marshall Faulk and 527 behind Tim Brown. "I want to go out with another ring, and I want to go out No. 5 on the all-time all-purpose yards list," Sproles said. His quest to do that might be aided by NFL kickoff rules changes that observers think might make kickoff returns more like punt returns, with an emphasis on quickness in tight spaces. Special-teams coordinator Dave Fipp has indicated interest in having Sproles, who last regularly returned kickoffs in 2011 for New Orleans, perform both tasks. Sproles said he hadn't heard that, doesn't know how the new rules will shake out. But the Eagles, who brought back Sproles on a one-year, $1.4 million contract, don't seem to doubt that he will make an impact one way or another. Pederson said Tuesday he envisions Sproles filling the same kind of offensive role he had in 2016, Pederson's first season in charge, when Sproles rushed 94 times for 438 yards (4.7 yards per carry) and caught 52 passes for 427 yards. "He's a tremendous third-down back. He's smart. He understands protection, which is a vital part of third down. He does a nice job out in space, route running away from the ball," Pederson said. "So we'll see where he's at, and try to keep him in that same situation."